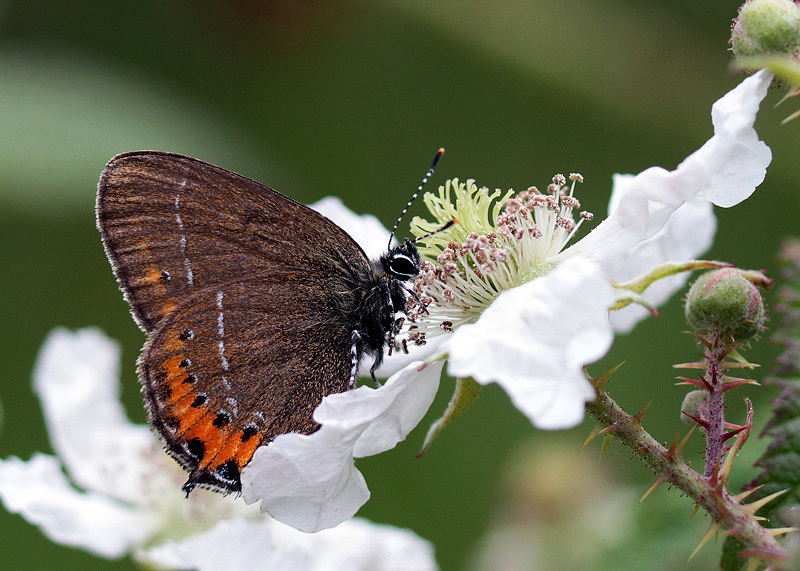 More than two thirds of UK butterfly species were seen in higher numbers in 2018 than in 2017, with two of the UK's rarest – Large Blue and Black Hairstreak – enjoying their best years since records began. However, despite the upturn, 2018 was still an average year for UK butterflies, with 36 species showing signs of decline. These findings come following the results of the annual UK Butterfly Monitoring Scheme. Black Hairstreak was a major beneficiary of the 2018 heatwave (Darren Chapman). Black Hairstreak in particular enjoyed a phenomenal year, with numbers up by a whopping 900 per cent. Large Blue figures were up 50 per cent from 2017 levels, too. Brown Argus and Speckled Wood also thrived, recording their third best year on record. Small White enjoyed a good year after a recent run of below-average seasons, with Large White annual abundance up 118 per cent, Small White increasing by 155 per cent and Green-veined White rising by 63 per cent. The warm and sunny weather from April-July benefited all these species. The threatened Duke of Burgundy has been the focus of intensive conservation efforts recently, and, pleasingly, numbers were up 65 per cent. However, the hot spring and summer weather was not ideal for all species. Some grassland butterflies struggled, not helped by drought conditions drying out caterpillar food plants. Gatekeeper dropped by 20 per cent from 2017 levels and Essex and Small Skipper were down by 32 per cent and 24 per cent respectively. It was also a surprisingly poor year for some familiar garden species. Small Tortoiseshell slumped by 38 per cent compared to the previous year and Peacock was down by a quarter, while Red Admiral crashed by 75 per cent after a good year in 2017. Despite the glorious weather in 2018, Small Tortoiseshell declined once again (Clive Daelman). Professor Tom Brereton, Associate Director of Monitoring at Butterfly Conservation, said: "2018 brought some welcome relief for butterflies following five below average years in a row. However, there were not as many butterflies around as we might have expected given the fabulous weather over much of the butterfly season and overall 2018 ranked as barely better than average. "This and the fact that two thirds of butterflies show negative trends over the long-term, highlights the scale of the challenge we face in restoring their fortunes and creating a healthier environment. It remains to be seen what the knock-on effects of the 2019 heatwave will be. We know that extreme events such as this, which are set to increase under climate change, are generally damaging to butterflies." Sarah Harris, Breeding Bird Survey (BBS) National Organiser at the British Trust for Ornithology, added: "It is great to see hundreds of birders taking part in the Wider Countryside Butterfly Survey on BTO/JNCC/RSPB Breeding Bird Survey squares. By doing so, dedicated and skilled volunteers are bringing together the monitoring of multiple taxa groups at each survey site and contributing to butterfly population trends. This is a fantastic example of how partnerships should work. I encourage anyone interested to take part in the Wider Countryside Butterfly Survey on either their Breeding Bird Survey squares or on Butterfly Conservation's survey squares."